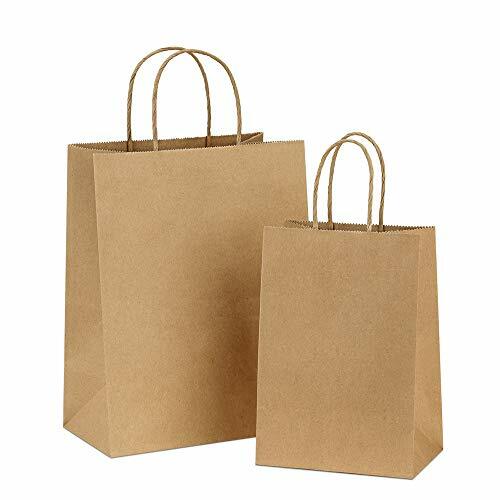 PERFECT SIZE PAPER BAGS - 5.25x3.75x8& 8x4.75x10.5 Inch, 50pcs each size. 110g basis weight kraft paper with a serrated top edge. These brown bags are made of 40% PCW Recycle Paper. FSC COMPLIANT. GOOD QUALITY - All paper bags with paper twist handles are well constructed. No stray glue any where and the solid bottoms can make it stand alone easily. MULTIPLE USES - These brown bags are a wonderful medium size for any number of things. Great for shopping bags, gift bags, kraft bags, retail bags, mechandise bags and standard paper bags.